Redfree is one of the second wave of disease-resistant, scab-immune releases from the PRI breeding program. It is becoming increasingly popular in Maine and is starting to turn up in smaller commercial orchards and here and there in farmers’ markets. 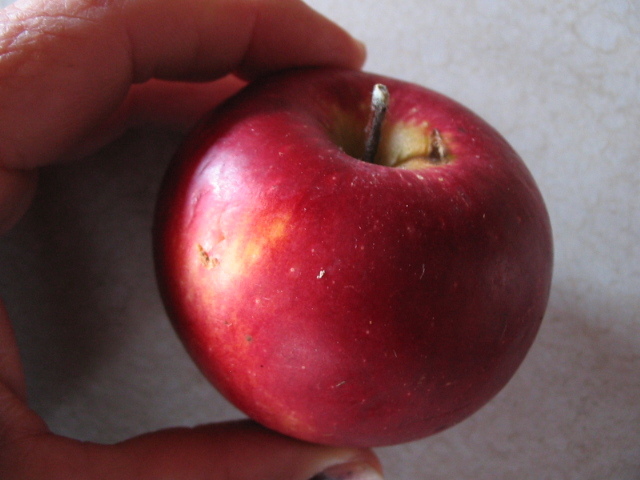 This medium-sized, round apple ripens the first week in September in central Maine. At a glance the skin looks to be solid red, but on closer inspection, darker red stripes are visible throughout. Redfree is not nearly as purple as Liberty or even McIntosh. A green spot accent surrounds the stem. Redfree is one of the of the only summer apples you can call crisp. It is excellent fresh eating and makes a creamy, thick, sweet applesauce. It will keep two weeks in the kitchen or two months in cold storage.